The Democratic National Committee is today launching an effort to force Republicans "to stand with the Tea Party or disavow their beliefs," as DNC Spokeswoman Brandi Hoffine put it in a release. 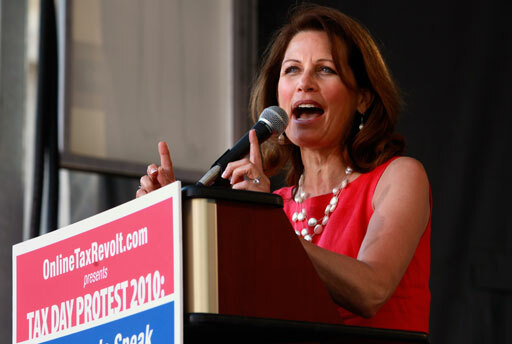 The group is urging local reporters in 30 districts to press House Republican candidates and officeholders to specify whether they will join Rep. Michele Bachmann's Tea Party Caucus. The DNC sent Hotsheet an example of one of the releases it plans to send out. It's entitled, "On the Tea Party, Where Does Eric Cantor Stand?" "Tea Party Republicans have advocated extreme policies that would take our country backward and are not what the American people want," the release reads. "Now, faced with the choice of turning their back on the Tea Party or embracing these radical views, the question remains: does Eric Cantor intend to join the Tea Party Caucus in the House of Representatives and sign on to its out-of-the-mainstream positions? And if not, why?" Democrats hope that by linking Republicans with the Tea Party movement they will keep moderates from casting ballots for GOP candidates in the midterm elections. In response to the DNC's email, Cantor's office noted that the lawmaker has already said he won't join the Tea Party caucus. "I met with several of groups that operated under that moniker in Virginia; they're not all uniform," he told Politico. "That's part of the beauty of the tea party movement; it's organic. And it's certainly not Washington. So I think it's better left with the people." Added Cantor Press Secretary Brad Dayspring in an email to Hotsheet: "The DNC is a joke and apparently Chairman Kaine has assembled a dysfunctional research department. Hey, DNC, it's called Google - use it." Today's DNC push comes on the heels of the DNC's release of a document laying out what it says are the plans of the "Republican Tea Party," among them repealing the health care bill, privatizing Social Security, ending Medicare in its current form, extending the Bush tax cuts for the wealthy and abolishing the Departments of Education and Energy. They call the 10-point platform the "Republican Tea Party Contract on America." The DNC is including the "Republican Tea Party Contract on America" in its release to reporters. The Republicans being targeted are Jon Barela , Lou Barletta , Richard "Rick" Berg , Scott Bruun , Steve Chabot , Keith Fimian , Mike Fitzpatrick , Thomas Ganley , Tim Griffin , David Harmer, Randy Hultgren , George Kelly Jr. , Joe Heck , Adam Kinzinger , Kristi Noem , James Renacci , Steve Pearce , Jon Runyan , Steve Stivers , Todd Young , Brad Zaun, Eric Cantor, Joseph Cao, Michael Castle, John Boehner, Mario Diaz-Balart, Charles Dent, Paul Ryan, Kevin McCarthy, and Mark Kirk. Democrats are also vowing to spend August pressing Republicans to "stand with or stand up to the Tea Party" in press conferences, advertising and online, according to the DNC's Hoffine.